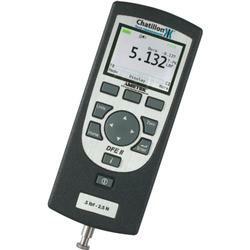 The Chatillon® DFE II Series marks a new era in digital force measure­ment. This compact, easy-to-use force gauge is designed for economy applications without compromising functionality. Ideal for hand held or test stand applications. The DFE II Series is available with capacities from 2 lbf (10 N) to 500 lbf (2500 N). The Chatillon® DFE II Series marks a new era in digital force measurement. This compact, easy-to-use force gauge is designed for economy applications without compromising functionality. 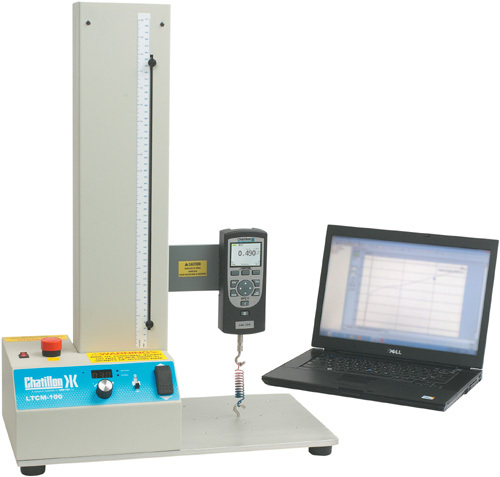 Ideal for handheld or test stand applications. 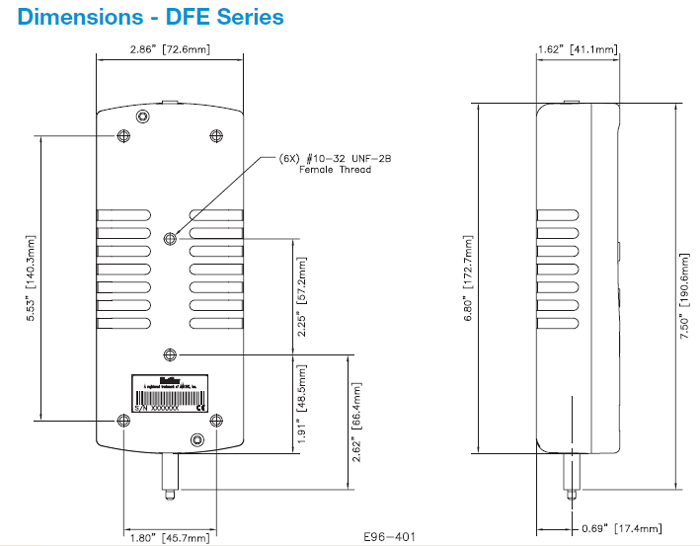 The DFE II Series is available with capacities from 2 lbf (10 N) to 500 lbf (2500 N). The DFE II features an integral load cell with a measurement accuracy of better than 0.25% full scale. A large, easy-toread, high resolution dot matrix LCD full color display supports a variety of standard gauge functions including normal and peak readings, high/ low limits, setpoints, pass/fail results, statistical results, load cell actuation and direction. Loads are displayed in ozf, gf, lbf, kgf and N units. The display can be inverted and displayed results may be “hidden” from the operator. The DFE II now also includes multiple language interfaces. The DFE II is able to change the display language from English to Spanish, French, German, Portuguese, and Chinese. The user can view the screen in color and a local language. 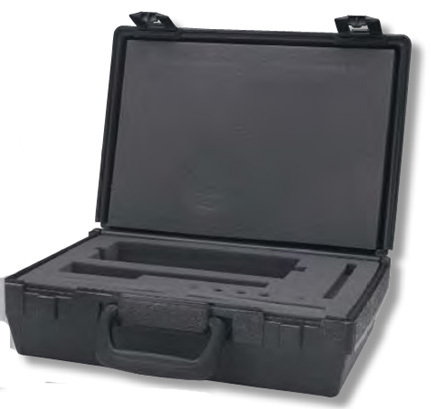 All DFE II Series force gauges come with a carrying case, battery adapter/ charger, testing accessories, RS232 cable and NIST Certificate of Calibration with data. The DFE II Series has analog, USB and RS232 serial communication. A large, easy-to-read full color LCD can display readings, icons and visually indicate gauge or test status using various colors. The high resolution display features brightness adjustments and can be inverted when required. The display can even be “hidden” at the press of a button. A load bargraph indicating load direction, measured load and safe load and helps prevent overloads : the load bar changes from green to red to indicate proximity to load cell capacity. The integral loadcells feature mechanical overload protection at 150% Full Scale. The rubber keypad features dedicated and dynamic function keys. The function keys correspond to displayed options and guide the user during operation. A navigation pod lets you navigate through the menus and to scroll and change values quickly. The innovative “i” key can be used to display critical information on the gauge such as gauge capacity and resolution, battery life remaining, loadcell overload history, even service information including last calibration date, or the location of service centers. The DF II Series features an integral loadcell sensor that delivers repeatable, accurate results. The innovative load bargraph shows dynamic load, direction of load and warns you of pending overload conditions. Smart technology in the gauge even keeps track of overload history to aide in maintenance and troubleshooting. FREE UPS Next Day Air Shipping! The DF II Series has a universal mounting backplate that enables you to fit the gauge to commonly used Chatillon force testers including the MT Series and LTCM Series testers.